1. The Bill for nursing of Children in Wales. 2. The Bill for Corn to be carried into Ireland, and for Customers. 2. The Bill of the Bakers of London, and other Bakers. L. 2. The Bill for carrying Horses, Mares, or Geldings, into Scotland, or beyond the Sea. 1. For Respite of Homage in the County of Lancaster. 1. 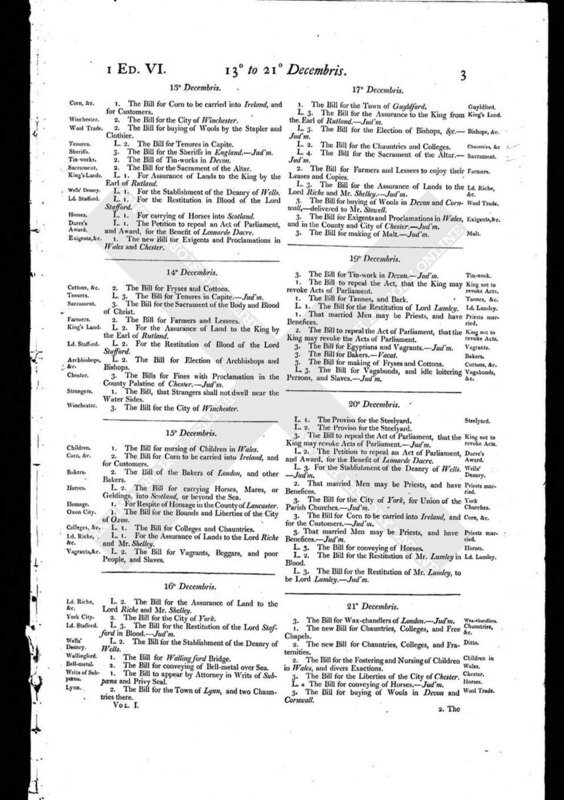 The Bill for the Bounds and Liberties of the City of Oxon. L. 1. The Bill for Colleges and Chauntries. L. 1. For the Assurance of Lands to the Lord Riche and Mr. Shelley. L. 2. The Bill for Vagrants, Beggars, and poor People, and Slaves.